Replace your Garmin Nuvi 3590LM Battery or Keep an Extra Battery on hand as a backup. This kit comes with an Extended Capacity 1250 mAh, Lithium-Polymer Battery that offers up even more up time than your original. Works in your Garmin Nuvi 3590LM GPS. Simple, Easy and Inexpensive! 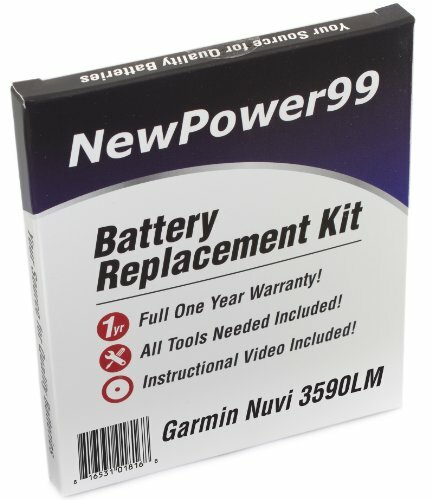 You get a New Battery, FREE Tools (necessary for installation), Video Instructions AND You also get a full ONE YEAR Money Back Guarantee exclusively when you purchase Innovate88's Garmin Nuvi 3590LM Battery Replacement Kit. If you have any questions about this product by NewPower99, contact us by completing and submitting the form below. If you are looking for a specif part number, please include it with your message. Battery Replacement Kit for Garmin Nuvi 2595LMT with Installation Video, Tools, and Extended Life Battery. TomTom Go 720 Battery Replacement Kit with Installation Video, Tools, and Extended Life Battery. Battery Replacement Kit for Garmin Drive 51 with Installation Video, Tools, and Extended Life Battery.